Saturated fats are often called the ‘bad’ fats. However, there has been a lot of confusion recently about the effect and extent saturated fats have on your body. This article will look at evidence behind saturated fats and clear up some of the confusion. Fats are a type of macronutrient, like protein and carbohydrates. Each fat molecule contains one glycerol molecule and three fatty acids. These fatty acids can either be saturated, monounsaturated or polyunsaturated. The determining factor is the number of double bonds in the molecule. 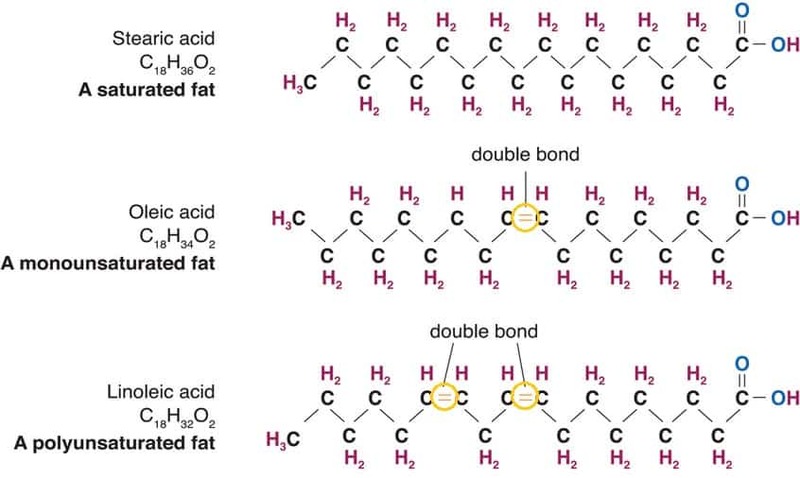 In saturated fats, every fatty acid’s carbon atom is saturated with hydrogen. Saturated fatty acids tend to have higher melting points than unsaturated fats. This means they tend to be solid at room temperature, like butter. Unsaturated fats tend to be liquid at room temperature, like olive oil. It’s important to remember that “fats” contain a combination of different fatty acids. No fat is pure saturated fat, or pure monounsaturated or polyunsaturated. All fats contain 9 calories per gram. This includes both saturated and unsaturated fats. Many baked goods and fried foods also contain high levels of saturated fats. Why are Saturated Fats Thought to be Bad? Saturated fat increases low-density lipoprotein (LDL) cholesterol. High levels of LDL cholesterol have been associated with increased risk of cardiovascular disease. Saturated fat intake increases LDL cholesterol in comparison with all nutrients except trans fats (1). Total cholesterol and LDL (the “bad”) cholesterol decreases when polyunsaturated fat replaces saturated fat (2). Although HDL (the good”) cholesterol is also reduced, LDL cholesterol is reduced even more. This increases the ratio of good cholesterol to bad cholesterol (3). Projections indicates coronary heart disease risk reduces by about 10% for each 5% energy substitution (4). However, these benefits are likely to be underestimated. This is because polyunsaturated fats have other benefits other than reducing cholesterol. These include reduced inflammation and insulin sensitivity improvements (5). Replacing saturated fat with monounsaturated fat decreases LDL cholesterol. However, this reduction is less than when polyunsaturated fats are the replacement nutrient (6). Replacing saturated fatty acids with refined carbohydrates and sugars may worsen the risk of cardiovascular disease (7). In addition, solely focusing on reducing total fat and saturated fat can be counterproductive. This is because dietary fat is typically replaced by refined carbohydrates (8). This is one of the reasons low-fat public recommendations haven’t helped tackle the obesity crisis. However, studies do suggest replacing carbohydrates from whole grains can help reduce the risk cardiovascular disease (9). Polyunsaturated fats reduced risk of coronary heart disease by 25%. Monounsaturated fats reduced risk of coronary heart disease by 15%. Whole grains reduced risk of coronary heart disease by 9% (10). Are There Any Benefits of Saturated Fats? There are foods high in saturated fat that can also be highly nutritious.These tend to found non-processed foods like red meats and diary. They contain many important nutrients like vitamin A, D, E and K.
While your body needs these vitamins to work properly, you don’t need to eat foods containing them regularly. Although substitution of red meat with red meat with fish, poultry, nuts, legumes and whole grains has been associated with significantly lower risk of mortality, we have a spectrum of choices; it’s not all or nothing (11). Mainstream dietary advice remains to reduce saturated fat. However, some recent studies have reported no significant association between saturated fats and cardiovascular mortality (12) (13). However, these studies have been disputed. According to the British Nutrition Foundation, these types of studies have inherent limitations. The use of baseline dietary assessments as a means of classifying subjects’ diets over a period of 20–30 years, particularly with respect to dietary fat intakes which have changed dramatically over this period, is problematic. Studies also often fail to specify the replacement macronutrient for saturated fat. They often don’t discriminate between different sources of dietary carbohydrates either (16). As seen previously, when saturated fats are replaced with poor quality, refined carbohydrates, neutral or even negative effects are shown. A paper published questioning recommendations on limiting saturated fat by New York Times. The column was titled “Butter is Back.” Both co-authors of the paper actually favor an end to low-fat diets, but clarify that that is not a green light to indulge on saturated fats. In reality, the study was in alignment with mainstream dietary recommendations, and suggested eating unsaturated fats in place of saturated fats. How Much Saturated Fat Should I Eat Per Day? the average man aged 19-64 years should eat no more than 30g of saturated fat a day. the average woman aged 19-64 years should eat no more than 20g of saturated fat a day. Most studies show saturated fats can increase LDL cholesterol in your blood. This has been associated with increased risk of heart disease and cardiovascular disease. There are significant health benefits to replacing them with unsaturated fat and whole grain carbohydrates. However, solely reducing saturated fat may lead to more refined carbohydrates eaten. This has little or even negative effects on health markers. The overall dietary picture should take preference. Saturated fats are just one piece of the puzzle. One meal a week of red-meat or occasionally overindulging in cheese is fine. When limited, these will have little effect on long-term health. Just don’t make it a regular occurrence.